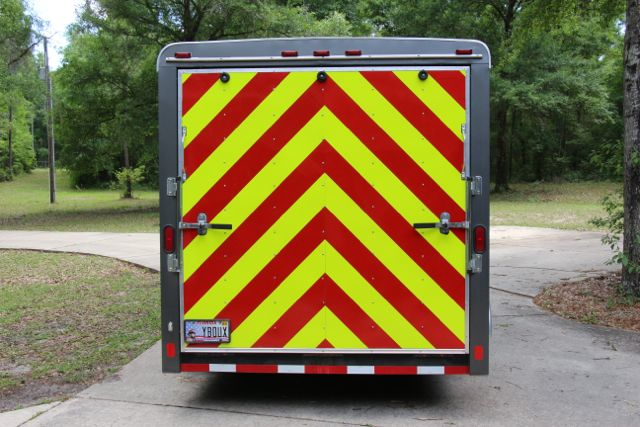 The trailer pictured in this article has been striped with a chevron panel using 6″ wide rolls of Orafol / Reflexite V98 in a red and a fluorescent lime. 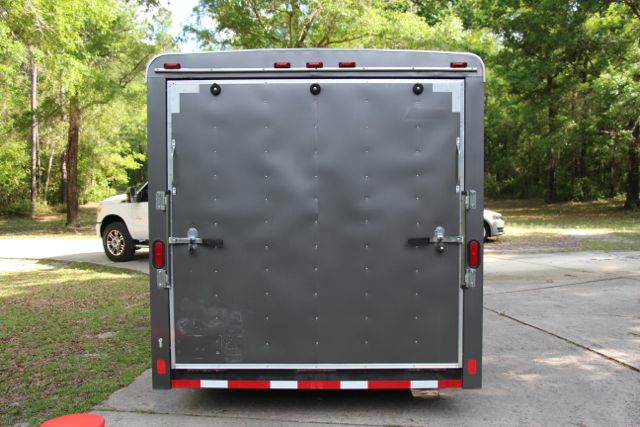 The first picture below is the trailer unstriped. At this stage you would have already measured the height and width of the area to be striped. For every square foot of area you would need a foot of 6″ lime and a foot of 6″ red plus a little extra. (about 10%) Once you have the striping in hand you would clean the surface with soap and water and then wipe it down with alcohol and let it dry. At this stage you can also remove any thing may be in the way of the striping. These items would be reinstalled later after the striping is installed. The picture below shows the trailer partially striped. To begin this pattern you would cut a triangle with 45 degree sides and apply it dead center. Draw a line dead center from the peak of the triangle upward. Then cut each piece separately and apply. I normally lay a piece on the trailer with the backing on the tape, then measure, then cut, then peel and apply. Press all the pieces on well with a cloth or squeegee. I go back over the edges the next day also. This assures a nice seal on the edges. Since V98 is a single layer film and will not delaminate edge sealing is not required. However, on the outside edges of a chevron pattern, running a bead of clear coat along the edge will help the material resist lifting and add longevity to the application. The picture below shows the completed project. As you can see the trailer is much more visible from the rear now. 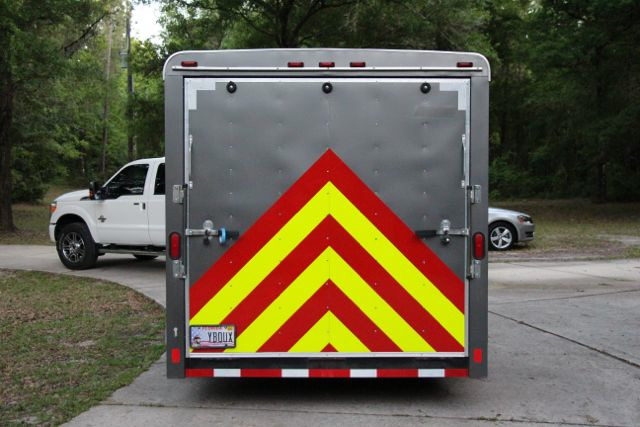 A trailer with tens of thousands of dollars in equipment inside is now much less likely to be hit due to the application of about $300 of highly reflective tape. A good investment. We carry the reflective material for a project like this at www.chevronpanels.com . Call me at 850-934-3157 with any questions.